Notes: Oct. 1938←Nov. 1938→Dec. 1938 Vol 12, No 6. 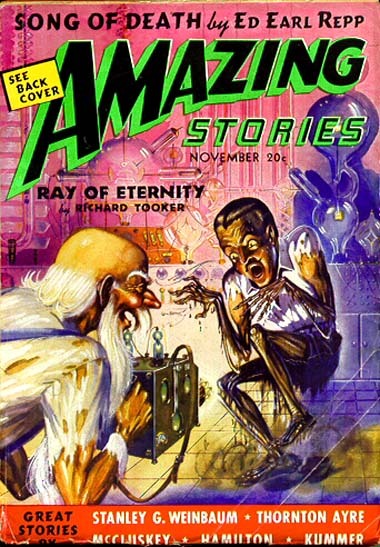 Cover illustrates "Ray of Eternity." Table of contents credits interior illustrations to Robert Fuqua, and Julian S. Krupa. Attributions for individual illustrations by signature if present or recognizable, using the most complete form of the artist's name found in this issue. 90 • Pirates of Eros • short story by Frederic Arnold Kummer, Jr.
143 • Meet the Author: Frederic Arnold Kummer, Jr. • essay by Frederic Arnold Kummer, Jr.